Note: Three of Francesco's children are missing from this photo. 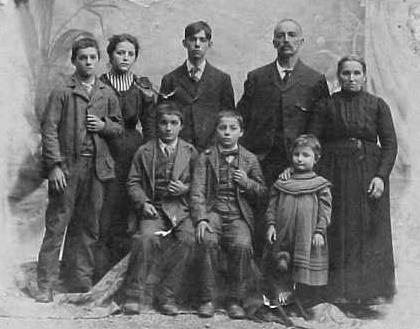 Antonio left for America in September of 1894. Mario went to America in December of 1901. Catterina entered the convent of the Dominican sisters of Saint Catharine, Kentucky in Sept. of 1903. Nicola went to America in 1911 and Aristede went in 1912. 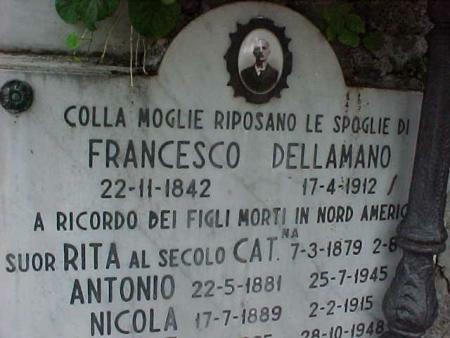 Francesco had two other children who died young. Note that Antonio is listed on this stone, as welll as his sister, "Suor Rita" (a Catholic nun) and his brother Nicola, even though they died in America and are buried in America. The dog's name is Brill. Emilio is son of Francesco Francis Dellamano and brother to Antonio Dellamano. This photo was taken on the porch of the Dellamano home in Gisazio, a hamlet in the town of Perledo in the province of Lecco in the Lombardia Region of Italy. 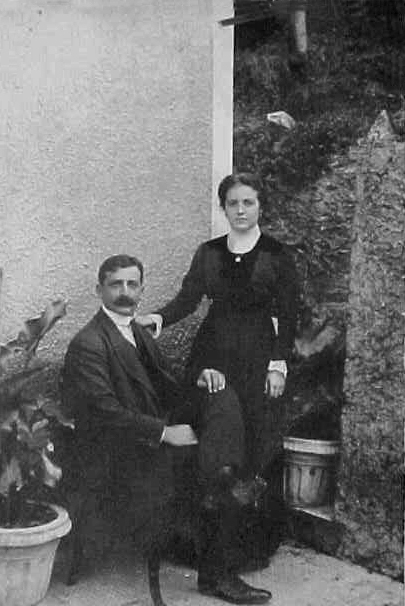 Emilio lived in America with his wife for about 15 years, after which they returned to Italy. 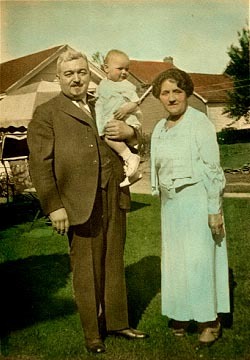 They had two children, Frankantonio and Rita. Both children married and are living in Gisazio, Italy. Antonio Dellamano is holding his grand-daughter, Beatrice (Babs) Barry. The photo was taken in 1935 on Long Island, New York.